Take the 505 Dundas Streetcar, get off at Sumach Street, and walk to Daniels Spectrum, opposite the new Regent Park. The 65 Parliament Bus will take you from the Castle Frank subway station to the corner of Dundas East and Parliament Street. 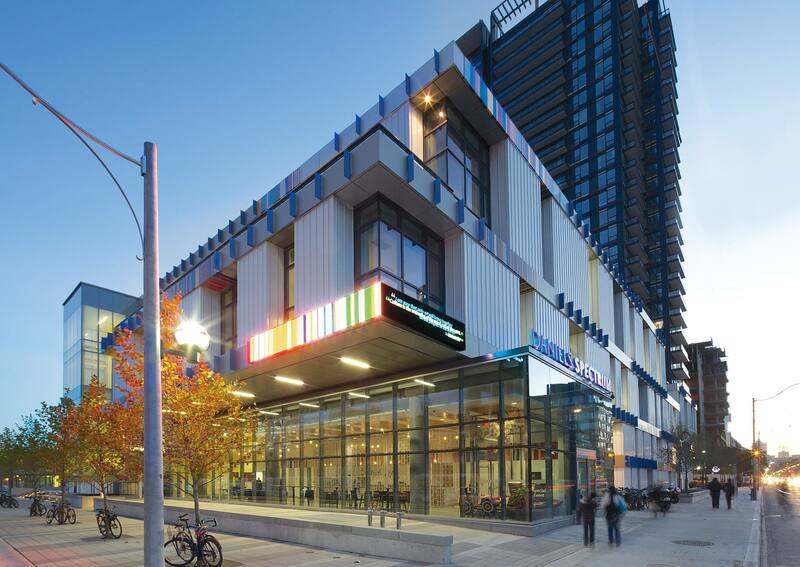 Transfer to the 505 Dundas Streetcar or walk east a few blocks to Daniels Spectrum, opposite the new Regent Park. From the north: Take the Don Valley Parkway southbound. Exit at Richmond Street East. Drive west to Parliament Street, then turn north (right) to Dundas Street East. Turn east (right) to Daniels Spectrum. From the west: Take the Gardiner Expressway or Lakeshore Blvd. (check traffic reports for slowdowns due to construction) to Sherbourne Street. Turn north (left) to Dundas Street East. Turn east (right) to Daniels Spectrum. Paid public parking is available in the underground lot beneath the Daniels Spectrum. The vehicle entrance is off the laneway to the south of the centre, accessible via Sackville Street just south of Dundas Street East.